Flying Clockwork Avian comes into play with four +1/+0 counters on it. Clockwork Avian can't have more than four +1/+0 counters on it. At end of combat, if Clockwork Avian attacked or blocked this turn, remove a +1/+0 counter from it. 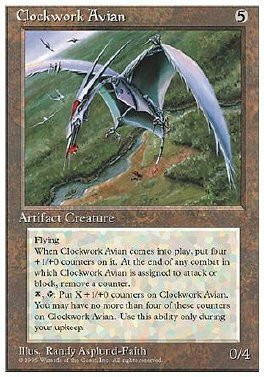 X, T Put X +1/+0 counters on Clockwork Avian. Play this ability only during your upkeep.